Swing Your Partner to the Left! I loved the waltz, the tango, the cha-cha, the fox trot, the box step, the complicated to say, spell, and learn schottische, and square dancing. I loved them all. I loved square dancing in particular. 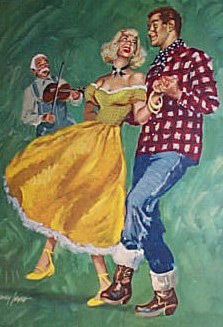 So much, in fact, that I was actually disappointed when the Southwest Sadie Hawkins dance didn't have square dancing, and -- years later at my sorority hay ride date party -- I dragged my flannelled frat date away from drinking in order to force him into a square with me. Matt and I were perfect dance partners. We both really liked it -- for me it was easier than running laps, being adequate at any sort of ball, and having to swim practically naked with the boys -- and we were both really good. We were so good, in fact, that when the rest of the class was still trying to master the steps to the fox trot or the waltz in a big paired-up circle, Matt and I would improvise and weave in and out of the circle, taking long steps and swirls that took us to the farthest reaches of the gym. My parents were shocked (SHOCKED!) when Ms. Eckert -- she was one of those Mizzez who seemed to require the extra stress on the title -- told them at parent-teacher conferences that their daughter -- the one who fell down for no reason, ran into walls, and acquired multiple bruises in odd locations with no memory of how they got there but with suspicions that it was from walking into a coffee table or car fender -- was actually quite agile and coordinated on the dance floor. All of the boys and probably most of the girls successfully endeavored to forget everything they learned about dancing as soon as they changed back into their school clothes. I didn't. I reveled in it. When we waltzed, I sang "I know you, I walked with you once upon a dream!" along with Tchaikovsky's music.